Sergeants Swordsmen are professional warriors, drawn from the lower classes. They have some skill in combat and are equipped with swords, shields and mail armour. 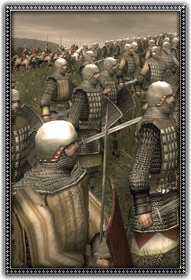 They make good defensive and offensive units, useful against both archers and other infantry. Their versatality and superior equipment compared to other units of their times comes at a higher cost.